I’ve been trying to help a couple patients quit smoking lately and so this topic is on my mind. By now it’s no secret that smoking is horrible for pretty much any aspect of your health. It is currently the number one cause of preventable disease and mortality in the United States, with 480,000 deaths occurring each year from tobacco use. 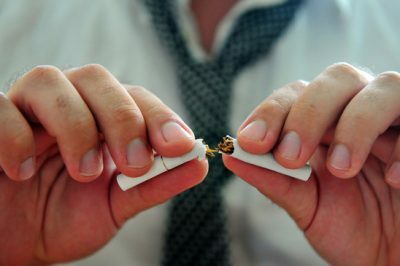 While some statistics show the problem to be getting better, the CDC still paints a grim picture in my opinion; in 2014 they said that 16 million people live with a smoking related illness and that almost 17% of adults 18 and over are smokers—a count of almost 40 million adults in this country alone! It is well documented how the chemicals in cigarettes affect cells of the mouth and lungs. Constant bombardment from toxins causes cells to react defensively and alters their DNA expression. Eventually, the practice becomes a game of Russian roulette where something in the genetic coding is bound to go wrong the more times cells are exposed to toxins. If that weren’t bad enough, smoking also impairs the body’s immune system and prevents cells from properly cleaning up the toxins that eventually cause cancer. Perhaps worst of all, most people that smoke are quite aware that it is terrible for their health, but because smoking causes both a chemical and a behavioral dependency, they are unable to break the habit on their own terms. In a relatively new area of smoking research, scientists are now showing that smoking has a profound effect on bacterial populations in the mouth. Researchers from NYU Langone Medical Center and Isaac Permutter Cancer Center have been studying this topic and published some interesting findings. Their results show that the mouths of smokers are dramatically different from the mouths of non-smokers. Smokers’ mouths have very high levels of 150 different bacterial species that are normally very low in the mouths of non-smokers—some of which being bacteria that are detrimental to oral health—and very low levels of 70 other species that are much higher in the mouths of non-smokers—mostly toxin-cleaning proteobacteria. For example, cavities are caused by bacteria in the Streptococcus family; smokers have 10% higher counts of Strep bacteria, which, in part, explains why smokers are much more predisposed to having tooth decay. As bad as smoking is, there is great news for those who quit. In most cases, the body is amazing at repairing itself and bringing things back in balance. The research team mentioned above documented that upon quitting, oral bacteria return to their normal levels and after 10 years of being cigarette free, bacterial populations are indistinguishable from the mouth of a non-smoker. Plenty of research suggests the same thing occurs on a systemic level; the effects of quitting are not only very positive, but they also happen quickly and dramatically.